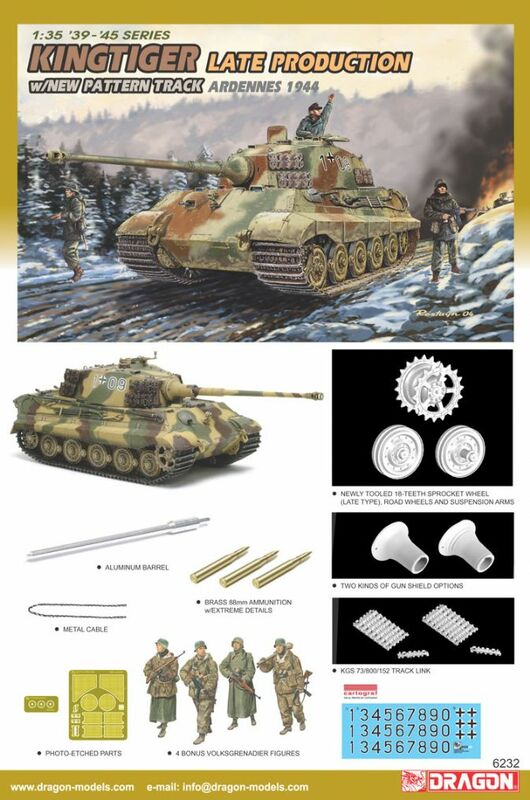 To commemorate the 60th anniversary of this important battle in WWII, Dragon brings you this fully detailed King Tiger kit. The King Tiger Heavy Tank played an important role in this battle. Some King Tigers of the sPzAbt 506 and SSsPzAbt 501 were equipped with 18-teeth sprockets and the new track Kgs73/800/152 for test purposes. The German Ardennes Offensive starting in late December 1944, popularly known as the Battle of the Bulge, was the last major German offensive on the Western Front in World War II. It was intended that the German army would split the Allied line in half, capture Antwerp, sweep north and encircle and destroy four Allied armies, thus forcing them to negotiate for peace. Although unsuccessful, it nevertheless tied down huge amounts of Allied resources, and a slow response to the resulting gap in their lines erased months from their timetable. An alternative analysis is that the offensive allowed the Allies to severely deplete the cream of German army outside the defenses of the West Wall and in poor supply state, greatly easing the assault on Germany afterward. In numerical terms, it is the largest battle the United States Army has ever fought.